Do you make lunch for your husband before he goes to work? My mom got up early and made lunch for my dad a lot of days, and I think she still does. I always pictured myself doing that for my husband, but I rarely do. Of course, his work schedule is weird…he works three days a week and actually takes two lunches each day because the shifts are so long and he’s doing manual labor the whole time. He has never made me feel guilty or bad for not making his lunches…every once in a while he’ll ask me to make the sandwiches or put together leftovers if he’s rushed, but usually he just gets it all together for himself. So, wives of working husbands…should I make lunch for him? Is it my wifely duty? I think one of the coolest things I’ve found recently is an organization called ‘Human Milk 4 Human Babies‘. This is how we fed breast milk to Evangeline for her first two weeks. So a couple weeks ago I was reading this blog I enjoy, and she was writing about how she participated in donating milk to someone through this organization, HM4HB. I ended up looking on Facebook for their North Carolina page, and was amazed at how awesome it is. People post on the wall when they are in need of breast milk…some are moms who just couldn’t breastfeed for whatever reason, some have adopted babies and want them to have breast milk. Then, someone else who has more than enough pumped milk and is in their area responds to their post to set up a time to meet. I realize that not everyone would be comfortable with taking milk from a stranger…a legitimate concern, and one I would probably struggle with if I was the one needing breast milk for my baby. However, if the site was selling the milk, I’d be much more concerned. When there is really no benefit to the mother giving her milk away, I can’t see why she would knowingly give away tainted milk. That’s my opinion at least…I do tend to be optimistic about people in general, but I really don’t think there are many people out there who would knowingly make a tiny baby sick. Anyways, if I had an electric double pump and a little extra time, I would be donating milk to some of those mothers…there are quite a few that post within my area, and I’ve had a very good supply since week one. How cool is it that mothers can network together over Facebook and help each other do what is best for their babies? Yes, that really is a cloth diaper! Last month I took a train ride down to Florida with Evangeline (much easier than expected!). On the way back, there was a nice lady sitting next to me who let me change Evie’s diaper on her seat. When I took her diaper off and put it in the wetbag (a waterproof bag for dirty cloth diapers), she took the bag and started walking down the aisle toward the trash can!! I said ‘Oh, those are cloth diapers!’. She looked surprised and brought them back…she said it’s a good thing I said something or those diapers would have been goners. She also said she was wondering why those diapers looked so cute. I have explained to so many people in the past months how the “new” cloth diapers work, and have had so many people say something along the lines of ‘Wow, they’ve come a long way since I (or my mom) used them!’. 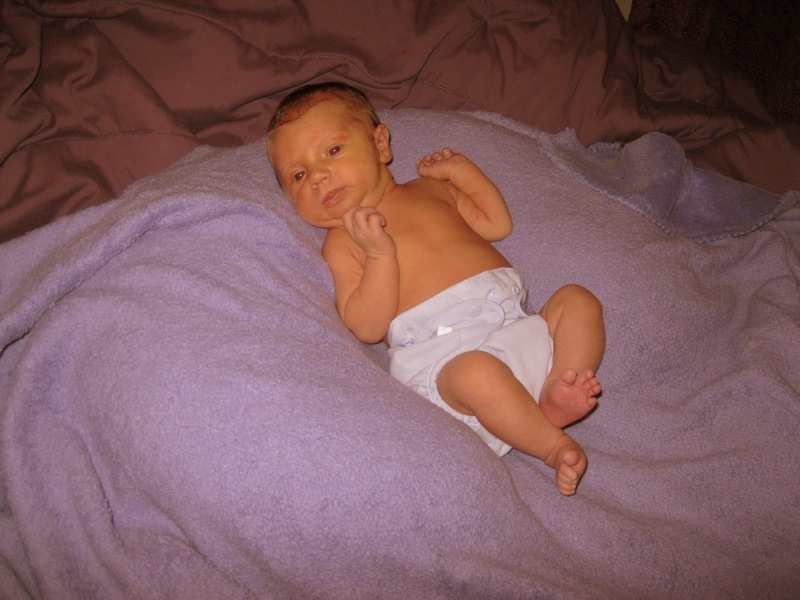 I have really enjoyed my adventures in cloth diapering. I remember a few months into my pregnancy when I was researching and deciding whether or not to cloth diaper…it was so completely overwhelming, I ended up bawling my eyes out after spending several hours online and getting totally confused, feeling like I would be a terrible mother because I didn’t even know what kind of diaper I wanted to use. After a bit more research and talking to some others who cloth diaper, I finally decided to go for it, and it has been one of the best decisions I have made for our family. This is her first time wearing one of our cloth diapers…she was only four weeks old, so she kind of swam in them! But they still didn’t leak, and she has grown into them since then. We mostly use Flip diapers, by Cottonbabies. We also have a few Kawaii and Fuzzibunz pocket diapers that we use at night. Evie with Grandma S…how cute is that jean print?! I’m not going to write a ‘Top 10 reasons to Cloth Diaper’ post since it’s been done a lot in the blogging world, although if you want to see them you can go here. (Sweetbottomsbaby.com is my favorite place to buy cloth diapers, by the way….free shipping on any order!) I will say that the #1 reason we chose to cloth diaper was economical. It is way cheaper! We’ve spent probably about $200 on cloth diapers (and some of that is just because I couldn’t resist a cute diaper, not that we needed it). The diapers we have are all one size diapers (they adjust from about 8-35 lbs), so they’ll last until potty training most likely. I seriously doubt I’ll be able to resist buying a few more, especially when they go on sale, but still…if you’re really strapped for cash, you can definitely get away with spending about $150 total. There will be a few ongoing costs, like a special diaper rash ointment (although most cloth diapered babies get a lot fewer diaper rashes) and a special laundry detergent (although I found a detergent that will probably last about 150 loads for $11…not bad!). Our water bill is a little higher, but electric is being less affected because I hang dry the diapers every time I can (added benefit to hang drying is that the sun gets any stains out!). We’ve also got mostly neutral colored diapers, so we can use them on our next child too…more savings! So all that to say, I love cloth diapering Evangeline! If you want to find out more about it feel free to ask me, but I would recommend going to this blog. Autumn Beck has a lot of good posts about how to cloth diaper and making it work for your family, and she’s great about responding to questions…but be sure to check out her recommendations first, since she probably has the answer to your question there somewhere. I really hope that if you are pregnant or have a baby you’ll consider using cloth diapers…it might not be for everyone, but if I can do it, anyone can do it. I’ve been working on becoming an excellent wife to Adam for 1 year and 8 months, and becoming an excellent mother to Evangeline for 3 months.